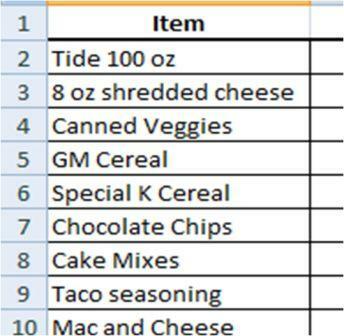 Stockpiling 101- Save Money On Groceries! Have you heard the word stockpiling and wondered what it meant? Do you have to use coupons to stockpile? Is it hard to do? These were my questions when I decided I needed to spend less on groceries each month. 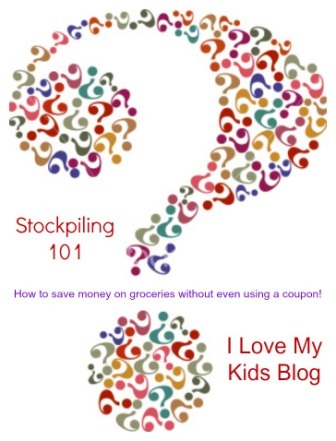 In this blog post I will answer those questions as well as lay out the basic steps to stockpiling, which will help you save money on your grocery bill! Before I jump right in to the meat and potatoes of this post I need to give you a little background information about how sales work! Manufacturers (companies that make products) allow stores to price their items on sale to a low point on cycles. It is up to the store the price they advertise. (This is why you will see a cereal sale at one store for $1.88 and another store at $2.50 on the same week. Keep adding to your list. Do you have: Cream of chicken soup? Toilet paper? Salt? Canned veggies/fruit? Oatmeal? Light bulbs? Salad dressing? Canned chili or tomatoes? Sugar? Flour? Any item that you use on a regular basis. Now we are going to add add regular prices, sale prices, and stock up prices (stock up prices are the cheapest price you can get it for). This is what my list looks like. Your prices may vary as I live in the middle of no where and our prices are crazy sometimes (and I don’t have a Target or a Walmart nearby)! You may need to go to the store to complete this part. You can even add a “shelf life” column like I added. Use your list and start stockpiling! Stockpiling is the easiest, fastest, least time consuming way to save money! (I think). Set aside a certain $$ each week/month for stockpiling, like $20. Check the weekly ad/circular/sales flier and look for items on your “list” that are at stock pile price. 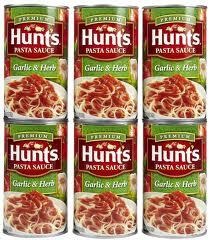 Hunt’s Spaghetti Sauce is on sale this week at my store for 77 cents wyb (when you buy) 10 cans at one time. I check my list, regular price is $2.69 each, a sale price$1.00. I haven’t seen it under 88 cents a can in over 3 yrs (in my area)! I use 1 can a week, I need 12 cans to get me through 3 months until the next sale. This price is so super and I have the storage space, so I will buy 20 at this great price! I will spend $15.40 for a 5 month supply. If I were to buy one can each week (for the next 20 weeks) at regular price when they weren’t on sale I’d spend $53.80! WHOA! I just saved $38.40 or 71% without a single coupon! IF you can find a coupon then this deal gets even sweeter….but it is already AWESOME without a coupon! So now you just bought your 20 cans of pasta sauce. Now what? All I have is pasta sauce….I need pasta too, right, but it isn’t on sale this week. What should I do? Don’t worry, just buy your 1 box/bag of pasta for the week at the regular price each week until you hit a sale! Hang on-it WILL be worth it! Stockpiling WILL take a couple weeks to pay off, but it WILL pay off. Don’t give up. You will stock up on sale items each week. Next week you may stock up on corn flakes & cream of soups. The next week you may stock up on taco seasoning and pasta. The next week there may be an awesome cheese sale. The key is to stock up on the items at their lowest prices but still purchase the items you need at the regular prices until a sale comes on those too! Before you know it your meals will be coming from your stockpile. I even stockpile my chicken by shopping with Zaycon! So how much money did I save by stockpiling this recipe’s ingredients for the next 12 weeks? I just saved $31.44 or 58% Just by being a SMART Shopper and stockpiling! I don’t want to eat the same thing EVERY week! Me Either! With the items I bought at the case lot sale this week I can make over 40 different recipes. Minus the perishables. 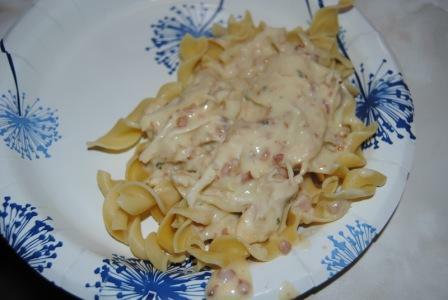 I can make enchiladas, tortilla soup, Crockpot lasagna, black bean tacos, garlic cheese spaghetti, pizza pasta, goolosh (yuck-but my hubs loves it), zesty basil pasta, broccoli cheese soup, super nachos, Italian chicken, etc.If half of your weekly dinners come out of your stockpile then you will be doing 50% better than you were before, Right? WHERE do I put it all? Under beds, in closest, in your basement. Stockpiling has cut our grocery bill down significantly and it isn’t hard to do, just a tiny bit of looking through the ads can save you a whole lot! I want to know what is your concern? Are you confused on anything I covered today? Is there another question I can answer for you? If so leave me a comment here and you will be able to see my reply! I do stockpile, but I keep the lists of items and relative prices in my head. I admire your organization skills and the way you’ve pulled it all together on a spreadsheet. One tip I might add is that Amazon is a good source for some items, especially if they’re available through the subscribe-and-save program; this might work for you especially since you don’t have a local Target or WalMart.